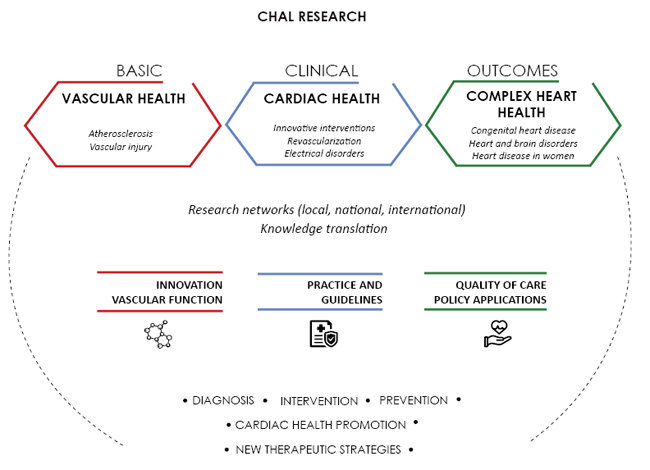 The Cardiovascular Health across the Lifespan Program (CHAL) includes fundamental, clinical and evaluative research platforms. Basic research in this program focuses on the study of biomarkers, histopathology, genetics, translational genomics and genetic epidemiology. Biomedical and clinical research is conducted in the domains of biodesign, health technology, regenerative medicine and information technology, with observational cardiovascular studies and clinical trials completed or underway. CHAL investigators with expertise in epidemiology conduct population health, outcomes and health services research. The CHAL program is primarily located at the Glen site of the Research Institute of the McGill University Health Centre (RI-MUHC), with several of its members at the Montreal General Hospital of the MUHC site. CHAL investigators perform research at the Centre for Translational Biology, the Centre for Innovative Medicine and the Centre for Health Outcomes Research at the RI-MUHC.